When I go to my violin teacher’s office located at Indiana University, I read the comic on her door. I do so every time because it describes me so well. My musical journey began when I was four. I loved listening to classical music and I thought everything about the violin was simply charming! Alas, that didn’t last so long; six months later I told Mom I wanted to stop because I didn’t like to practice. Well, we all go through that, don’t we? Isn’t that what the comic says? But I was too young to understand that, once you start something like an instrument, you can’t just suddenly stop because you don’t like to practice. Well, luckily my violin teacher held tight to my leash! I didn’t enjoy it that much, but despite this I continued…because I had to. In June, 2013, I moved from my natal Quebec, Canada, to Indiana. There, I did a four-week summer music camp, and for some reason I completely fell in love with the violin. I began practicing a lot. Like, a lot. I wanted to pursue it as a career, and I knew I would end up as a violinist someday. My first real success on the violin was on August 9th, 2015, when I took First Prize in the Indiana State Fair Violin Competition. The months before, my mom was pushing me to do what I had to do if I wanted to win. “You need to go practice for the State Fair Competition,” she’d say every day, and I’d obey reluctantly. From that moment onward, I was entirely self-motivated. Every single day I woke up, did my math, and then I practiced. A lot. And soon, it paid off. In November 2016, I was chosen to perform along with one of my friends (who is also a Seton student!) for a stage production of the children’s opera Brundibar. It was the very first time it was performed in Bloomington. The shows ran November 10-13, and every time it was sold out. I loved the experience a lot. That’s when I started practicing like a maniac. Every day during December and beginning of January, I woke up, ate breakfast, practiced, ate lunch, practiced, ate dinner, practiced, and went to bed. It paid off. On January 7th, at the Indiana History Center’s Basil Theater, at 12:45pm sharp, I went on stage and performed one of my best performances. However, I was really shocked when they called out my name. At the same time, however, I gave thanks to God, for he had helped me achieve what seemed to be impossible. On February 12th, I gave my winning performance at the prestigious Hilbert Circle Theater at thirteen years old. It was the most wonderful experience I ever had, and I’ll keep practicing so I can do it again! I won the First Place in the New World Youth Orchestras’ 2017 Young Artist Competition, Junior Division (musicians through age thirteen). 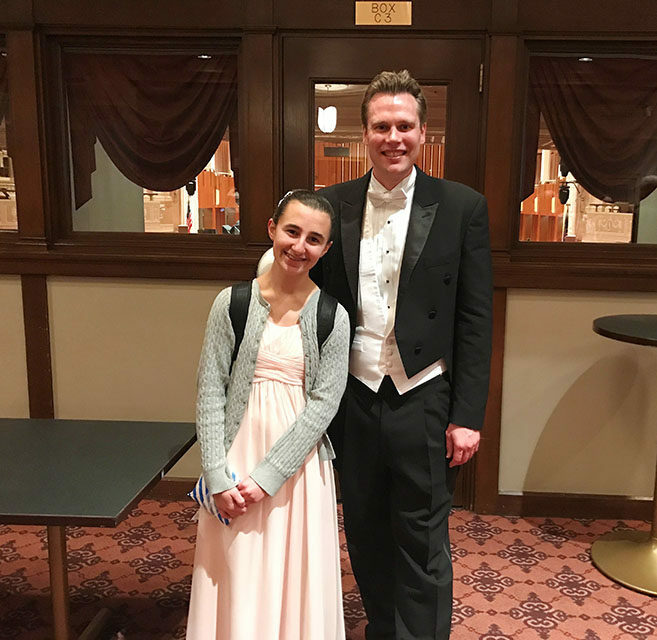 As a result, I performed De Beriot’s Scene de Ballet, a solo work for violin, in the Hilbert Circle Theater in Indianapolis, IN., on February 12th, 2017. Homeschooling helped me a lot in preparing for the competition! Many of my friends who go to school can’t practice as much as they would like, either because they come home too late or simply because they have too much homework to do late in the evenings, which is the only time they can practice. For me, I can arrange my homework schedule accordingly, depending on rehearsals with pianists (and, yes, with orchestras! ), lessons with teachers, and simply on how much I want to practice every day. Therefore, I can practice a lot in the morning and maybe less in the afternoon or vice versa, and this is such a great help to winning competitions! Also, if I have something big coming up, such as the concert on February 12, I could choose not to focus as much on homework and devote more time to practicing. I couldn’t do that if I went to school, and I feel really lucky! Homeschooling proves to be a main factor in my friends’ musical skills. Of those in my violin class who are technically advanced, almost all of them homeschool — and one of them, who won the Senior Division of the same competition, started homeschooling with Seton last September! Sometimes I feel like my only interest is the violin, since I practically devote my whole life to doing it, but I do have other interests. I love composing music, especially for string orchestras. For sports, during the winter I love doing alpine skiing (because I’m originally from Canada), and during the summer I do swimming and diving. Of course, all year-round I love playing outside, biking, and running. I really want to become a professional violinist, hopefully a soloist, but who knows what will happen! My first violin teacher was a great violinist and then she decided to enter the religious life, so I’ll leave that option open, too! But mostly it’s because I love solving problems and especially equations with variables, and solving for X in so many different (and complicated) ways! I love Composition because I enjoy composing and writing a LOT. My dad often reproaches me for writing too long book reports:). In fact, writing novels for my two enthusiastic younger sisters is one of my favorite hobbies. I’ve written five novels so far! NextSAT vs. ACT – Which Test for College?